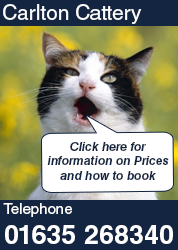 Carlton Cattery is located in Headley on Ashford Hill Road off the A339 Basingstoke to Newbury road. Although classed as being in Thatcham our location is a 10 minute drive from both Thatcham and Newbury. Many of our existing clients are local but many come from surrounding towns such as Kingsclere, Tadley and Basingstoke. Alternatively contact us using the form below. Items marked * are mandatory. Carlton Cattery is owned and run by Fred Stammer, licence No.18/01490/AWAAL. Issued by Basingstoke and Dean Borough Council.